Cheapskate alert! There's a new (as of 2018) parking fee here of $6. Money well-spent. You want to take a relatively easy hike with a massive payoff, and you’re not scared to drive to Albany to make it happen. Also, you’re cool when your nature comes served with crowds. **Update June 2018** After a one-year closure (see Thacher Park trail closed after hiker injured for details), the Indian Ladder Trail is open again! Thank you to Jen for giving us a heads-up in the comments! You can also find more details on the re-opening in this Albany Times Union article from June 8: Indian Ladder Trail will reopen Saturday. This is wonderful news — happy adventuring out there! **Update July 2018** TRAIL GUIDE OBSOLESCENCE ALERT!! Sigh. Thanks to Brian’s very helpful comment below, I’m afraid it looks like the trail guide below is bordering on obsolete. The parking rules have changed (the lot I recommend below is now a 30-minute lot only, not enough time to do the hike), and the other lots now have a $6 fee. Looks like you now need to park at the new visitor’s center (and pay the fee) for easy access to the Indian Ladder Trail. The mileage estimates, photos, descriptions, and bad jokes below are all still valid, but you’d probably do this loop in reverse if you started from the visitor’s center (rather than the overlook parking lot, as I recommended). It will likely be some time before I can get all the way back out here to do a revamp of this trail guide. In the meantime, you can check out the official Thacher PDF trail map to see the new layout. (On that map, the trail guide below starts at the spot marked “Overlook,” then follows the Turquoise-blazed Long Path to the start of the Indian Ladder Trail. Since you can’t park at “Overlook” for more than 30 minutes anymore, you’d need to park at the parking area next to the “V” on the map, and hit the Indian Ladder Trail from there. Should still be pretty easy to follow for anyone interested in checking out the sights documented below.) Thanks for the heads-up, Brian! Winter warning: This trail is closed between Nov 16 and April 30. During this time, you’ll want to pick a different hike, or concentrate on chipping away at your Netflix backlog. If something that awesome was in the Hudson Valley, surely I would have already known about it. Nope. Turns out, they were right, I was wrong. This amazing slice of awesomeness is right here in the Hudson Valley, as long as you count the upper boundary of the Hudson Valley as extending way up into the southern Capital District. Wait, Wikipedia is letting us count Albany in the Hudson Valley. Woo hoo! No need to annex any territory here – this is a legit Hudson Valley hike. And what a hike it is. You get views starting right from the parking lot, and they pretty much don’t stop the whole time. It would be difficult to overstate the amount of awesomeness waiting for you on this hike. From the huge overhangs to the waterfalls that shoot over the cliffs, generously allowing you to walk behind them, I really can’t imagine anyone not loving it here. The hike itself is relatively flat (with the exception of the very steep stairs on either end), making it a great hike on which to bring your friends who don’t even like hiking that much. Besides the views and cool sights, there are also fossils to be found embedded in the limestone here, which was a major draw to my six-year-old son. (Wikipedia calls the Helderberg Plateau “one of the most fossiliferous regions in the United States,” thereby making “fossiliferous” my new favorite word.) My son spent the whole time looking for a T-Rex in the rocks. Never did find that T-Rex, but I’m pretty sure we found some prehistoric clam doohickeys in there. Also, a note to the people who are scratching/etching the rock face for some reason, making it impossible to find fossils in one of the most fossiliferous places in the country: Please, please, please, find a new hobby. I hear video games are fun. We visited when my son’s school was closed for Election Day (a Tuesday in November), and even then, there were many dozens of people along the trail. On a sunny summer weekend, this place must be a mob scene. It certainly deserves to be. If you prefer your nature served with a little more solitude, you’d do well to hit this hike at an off-peak time. It’s most definitely a cool enough destination to warrant burning a vacation day – that’s what I did. Perhaps there are better ways to spend a nice day than visiting John Boyd Thacher State Park and hiking the Indian Ladder Trail. But I can’t think of what they might be. Bonus tip: One nice blog post on this hike recommended bringing a flashlight along, for kids to poke into the various caves and crevices. This was sound advice – my son had a blast wielding the flashlight at several spots along the way. He didn’t find any bears or dinosaur skeletons in any of them, but maybe next time. **Update July 2018** Just in case you missed it, please see the update above (to the “Background” section) from July 2018 for some important updates to this hike. 2. Well, that was a great hike, right? What a money spot! Back in the car, everyone – let’s go get some ice cream! 3. Climb a few stairs up to the quarter-munching binoculars. Feel free to read some educational signage about the Helderberg Escarpment upon which you are standing – might as well learn something while we’re here. 4. Just past those binoculars, the trail begins down some stone steps, where you’ll find a tree marked with an aqua blaze to the left of the steps. Head down the steps and follow those blazes! 5. The trail splits and merges several times as the official, aqua-blazed trail intersects with the shortcuts that people have tromped. Just keep chugging along, following the blazes and enjoying the views. Keep the fence on your right and you’ll be all set. 6. Just after you pass another parking area on your left (good thing you parked further away so you didn’t miss those views! ), you’ll come upon a stairway heading down to your right (turning left to ascend the steps would take you up to the parking lot). Turn right here to descend to the Indian Ladder Trail, one of the coolest places in the Hudson Valley, which puts it high in the running for one of the coolest places in the world (not to build it up too much, of course). 7. After noting the rules of the trail (no surprises here – and if you were considering littering, please go home right now and ask a loved one for an honest assessment of where you went wrong), down we go! 8. 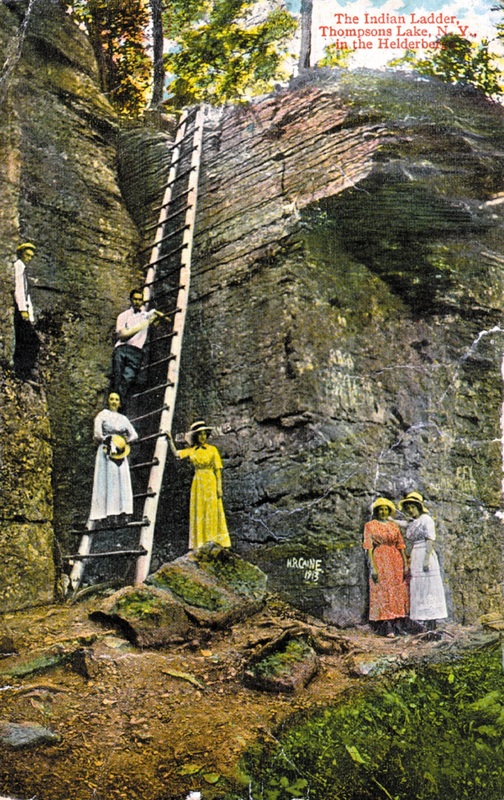 At the bottom of the steps, check out the picture of how people used to get up and down this cliff, before we got all soft and started using stairs. If this next section of trail isn’t already named “Tall Person’s Misery,” it should be. If you’re taller than four feet: First you spread your limbo feet, then you move to the limbo beat. How low can you go? If you’re a six-year-old: You may need a stepstool to get the peanut butter out of the pantry, but you’ve gotta be feeling pretty good about things right now. 10. From Tall Person’s Misery, head down some steps, stroll for a few more minutes, and then SHA-BAM! This is what you came for. The falls were pretty mellow during our November visit, but they were still awesome, and must be even more awesome in the spring when the water is rushing. 11. Enjoy a frolic under the gigantic overhang, looking at the back of the waterfall and the nice view beyond. You’ll also notice that you’re standing next to a placard that tells you that this waterfall is called Minelot Falls. Majestic, indeed. Take a quick peek in any caves you might find enticing. Or, you know, a long peek. Then let’s continue on, heading up the ramp on the far side of the falls, looking back over your shoulder at the scene behind you. Goodbye, Minelot Falls! ‘Til next time. 12. The trail winds along the bottom of the escarpment, climbing stairs and tromping through the woods, always staying close to the cliffs. You’ll arrive at the next money spot in about ten minutes. Also, find a new hobby, Tiffany. We’re trying to look for fossils out here. 13. And then, about ten minutes from Minelot Falls, boom! Another (probably seasonal, and much lower-volume, but still quite awesome) waterfall, complete with an underground stream emerging from under the cliffs and running across the trail. 14. Just past the falls and fossiliferous rocks, a footbridge crosses another underground (until recently) stream just as it ventures out from under the cliff. In a moment, you’ll see more educational signage, with an amazing picture of what the previous falls looked like in all their glory, before much of the water was siphoned off to underground streams. Dang it, underground streams, I really liked you until I saw this picture. 15. Walk another minute or two, and bang! Another point of interest. More caves to ogle, signs to read, and fossils to attempt to find. 16. After that cave, you’re almost to the end. A couple more minutes of scenic trail, and, sadly, you arrive at the staircase back to civilization. 17. Optional step: From the top of that staircase, you can check out the little observation deck to your right, which has a pleasant, but not earth-shattering, view. 18. 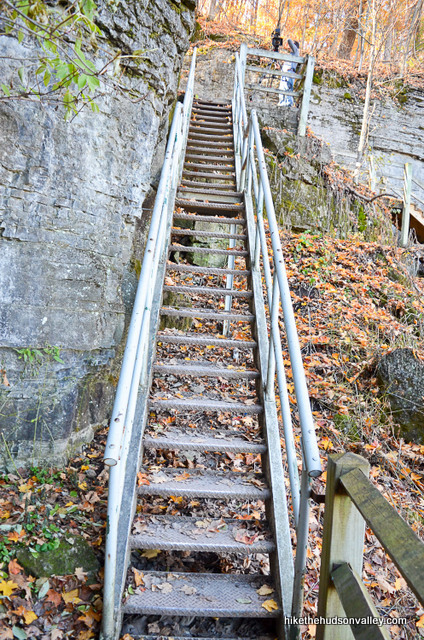 From the top of the staircase, head up the steps on your left to complete your jaunt on the Indian Ladder Trail. From the top of these steps, it’s choose-your-own adventure time! There’s a playground just around the corner, maybe a few hundred yards away (recommended for people with offspring – it’s a pretty good playground). There are also picnic pavilions, tables and benches, and a bathroom with a water fountain up there. If you’d prefer not to visit any of that stuff, just skip the next step. 19. Optional step: It’s playground time, homepeople! At the top of the steps at the end of the Indian Ladder Trail (you’ll see aqua blazes on the split-rail fence to your left), turn sharply to the right. Almost immediately, you’ll see an unmarked trail heading up and over the little hill on your left. Take that trail. In less than a minute, you should emerge into a clearing scattered with picnic tables. There’s even a horseshoe pit, in case you’d like to play a pickup game. Just beyond that clearing, you’ll find a pretty rockin’ playground. Awww, yisssss. Fire it up! On the far side of the street, you’ll also find a bathroom building with a fairly vigorous water fountain. After you’ve had your fun, retrace your steps back to the top of the steps at the end of the Indian Ladder Trail. You’ll find some helpful signage along the way. If you enjoyed this step, you can thank the cameraman for the PBS documentary, “The Great Ledge: Exploring Thacher.” He was filming right at the end of the Indian Ladder Trail on our visit, and he told us about the playground. Otherwise, we’d have had no idea. Thanks, cool documentarian dude! Also, right at the top of the steps that descend back to the Indian Ladder Trail, there was a huge construction zone (as of November 2015), featuring a picture of the soon-to-be-built Thacher Park Center. Looks like a cool place! If it exists when you visit, perhaps you should check it out, person of the future. Complete this hike as a loop by walking along the top of the ridge back to your car. Retrace your steps back along the Indian Ladder Trail. It’s probably better for your karma NOT to return on the Indian Ladder Trail if it’s a very crowded day. If conditions allow and that’s what you’re choosing to do now, happy retracing! Have a safe trip home, and may all your days be merry and fossiliferous. If you’d like to complete the loop along the top of the ridge, assuming you’re standing with your back to the stairs from the end of the Indian Ladder Trail, look left to find two aqua blazes (remember those?) on the split-rail fence. Turn left here to follow those blazes all the way back up to your car, about one relatively flat mile from here, keeping that fence on your left and enjoying the views from the top of the escarpment as you go. Bon voyage! Hope you had a great and fossiliferous time today! Whatever you decide to do, enjoy it! When you get back to the parking lot, perhaps a nice birdwatcher will lend your kid his binoculars to round out an already awesome, fossiliferous day. What a fantastic place. Thanks for being in the Hudson Valley and sharing your hikes with us, Albany! Now let’s go get some ice cream. Once you’re in the park: Coming into the park on Route 157 (also known as Thacher Park Road) from the south, you’ll pass several pulloffs and picnic areas – just keep heading into the park. When you see Glen Doone Picnic Area on your right, you’re getting close. Look on the right for “Cliff Edge Overlook” – that’s your huckleberry, turn right here to pull into the large parking lot. (If you miss the turn, don’t worry, there’s a second entrance in another hundred yards or so.) The picture here is taken as I pulled back out of the lot at the end of the day, so it’s the reverse of what you’ll see from Rt. 157. Pull into a parking spot (the farther to your left you can park when entering the lot, the shorter your hike will be), murmur an awed expletive at the view, hop out, and let the adventure begin! You can also get directions by checking out the Indian Ladder Trail entry on the HiketheHudsonValley.com Google map. From there, please see the “Directions to the trailhead” section directly above for further notes on locating the parking area. My fiancee & I did this hike today. I’m not sure if they changed something after the reopening, but the signs for the giant parking say, “Overlook Viewing – 30 minutes: All day parking available in other lots”(something like that; don’t remember the exact verbiage and forgot to take a picture). I wasn’t sure how this was enforced, so we kept driving down the main road and ended up at the Visitor’s Center, since it had an Indian Ladder Trail sign. Cheapskate alert: Every lot we encountered(except for the overlook viewing one) had a NYS Park pay booth and the ticket was $6. We were there at 8:15 or so and the booth wasn’t working; it told us to pay inside at the Visitor’s Center if it wasn’t working; we tried going in there, but it was locked(turns out they open at 9 AM). So we just ended up parking in the lot without purchasing the ticket. So we ended up starting the hiking at the other end and just doing everything in reverse. We turned around after entering the top of the stairs on the other side. We didn’t walk to the overlook parking lot; but did drive back there after we got back to our car. Really enjoyed the hike! Just a bit confusing start to it. hi brian, if you want to do this trail again search google map for “Parking for Long Path and Perimeter Trailheads” and you’ll add 2 great overlooks (high point and hang gliders) and nice trails to your hike. parking here is free. not that i’m cheap. lol 🙂 plus there are a lot more trail you can do from here to make your hike to indian ladder different each time. check it out on alltrails. Brian, I really appreciate the heads-up, and am sorry you had to find out the hard way about all of these changes. I’ve updated the trail guide above with a warning and a link down to this comment. Hopefully, that will save others the same hassle. I’ve also added a Cheapskate Alert to reflect the new parking fee. Thank you so much for taking the time to report all of these changes! About how long did this hike take? Hi, Desiree! I estimated the roundtrip in the trail guide above to be approximately 2.5 hours, but it could be done much quicker if you don’t stop to smell the fossiliferousness. Thanks so much, Jen! I just removed the warning above and replaced it with the good news. Much appreciated! As of today the Indian Ladder Trail is still closed. Website said it would be open May 1, so I thought I’d check it out. Saw a bunch of state workers in hardhats surveying the trail and asked them about it. They said it’s in rough condition, but would eventually reopen, although they said it wouldn’t be anytime soon. The Escarpment Trail was a nice alternative, but I was jealous of those hardhat workers and wanted to join them! there is another way you can hike to this trail from a trail locals call high point cliff located on old stage road. if you come up route 156 berne-altamont road, old stage road is on your left just after lewis rd on your right and follow it up a little curved hill and on your left you’ll see the parking lot. there is a sign that in bad shape if its still there. this trail take you to high point in 1.1 miles with a great view from here you’ll see hang glider point too on your right. another 3.1 miles you get to indain ladder & escarpment trails. if you do it this way you’ll avoid paying for parking at the park. here is a map from alltrails that will show the way. https://www.alltrails.com/explore/us/new-york/east-berne you’ll have to zoom in to see the name of old stage road but you’ll see the dotted line of the trail i am talking about. good luck and enjoy. Thanks, MGP! I updated the trail guide with a warning above Step 1 a couple of weeks ago, but your comment makes me worry that people might not see it there. I copied that warning at the very top of the trail guide just now, too. Hope nobody makes the drive just to find the trail closed, and thanks for your help to make sure that doesn’t happen! Lived about 13 miles from here all my childhood. We used to ride our bikes there and walk some of the “old trail” before it had to be redone. Also we went thru the “Fat Man’s Misery” crack in the rock down to “Hailes Cave” and hunched over, duck walked deep into the cave, bats and all. Years later the crack was covered over with a huge metal plate. Took my wife here in the 80’s and when she drank some of the water she said it was the best water she had ever had…. Loved reading this great story, it is well written. We did this yesterday. Hike felt a bit short considering we drove over 3hrs to reach here from NYC. We crossed the trail in about 35 mins. Lovely hike though. The cliff overhangs are different from usual forest/mountain hikes and very enjoyable. The grasslands near the parking are perfect picnic/bbq spots. Tip: There is a public restroom just up the road from the parking lot (Pt. 1 in Guide above). It’s somewhere halfway between the start (Pt.1) and exit (Pt.18) if you’re doing a circuit and walking back in the rim. Thank you so much for listing the hike. We visited yesterday on our way to UAlbany. The views and terrain were amazing! Excellent! Glad to hear it, Wendy! After making my family walk to the top of Overlook Mt. and Giant Ledge a couple weeks ago, they were happy to learn that we could drive to best views at Mr. Thacher’s park. The dog wasn’t very thrilled about walking down the first set of stairs, so I carried her down. She went up at the other end, if slowly. We’d love to go in the spring when the waterfall is more impressive. I know this is a HIKING site, but I have a 12 year old son who isn’t big on hiking. That said, he loved the Indian Ladder trail and was blown away by the geology and the majesty of the area. I’ve read all of the hikes on HTHV, but what else would you recommend in the Hudson Valley that has a huge geologic bang for minimal buck. We’ve driven to the top of Bear Mt and he loves that, I even took him up to Anthony’s Nose…which he was impressed by if exhausted. I’d love to get him hiking, but if I can’t do that I’d at least like to encourage his love of the outdoors by taking him to see more sights. Have you tried Bear Hill Preserve? That hike has an awesome view/calorie ratio: http://hikethehudsonvalley.com/bear-hill-preserve/. It also has geology that you can climb around inside. Hope that helps! Planning a trip ASAP, not sure how I missed this one. I pledge to re-read every single word of HTHV to make sure I’m not missing anything else. Thanks so much for taking the time to post such a nice comment, Joan. Glad this guide has been useful to you, and if you do decide to give it a go in this life (or another one), I hope you enjoy the trip! This is our go to hike with the kids. It’s a little gem for the Albany area.